Do you like the idea of following Jesus, at a distance? It seems safer that way, doesn’t it? Do you ever just want to sit this one out? I do. Like, me helping in prison ministry. I would really just like to leave that one alone. I really want to follow Jesus at a distance. Yet, when Christine Roseberry of InnerFaith Prison Ministry mentioned that most of the women they minister to in prison have lost hope, and you are a Hope Coach…yep. I received a bit more than a nudge that day. 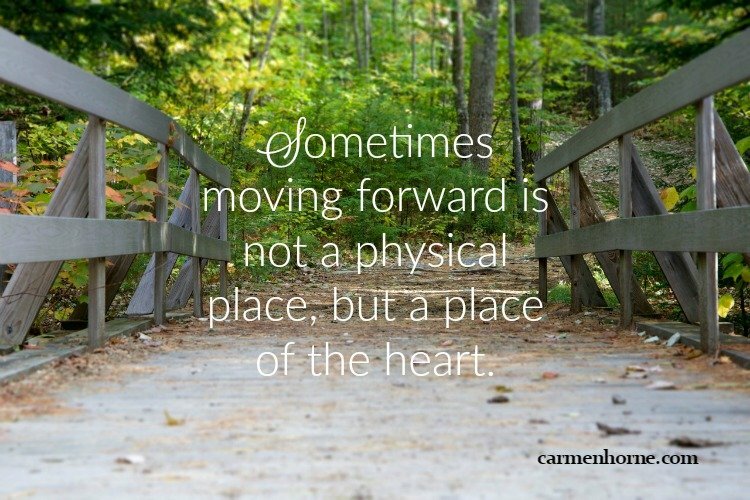 Has the Holy Spirit nudged you to move forward – someplace that seems scary and out of your control? This could be someplace that is really not a physical place, but a place of the heart. Are you willing to take one step? I’ve taken lots of next steps in my life, and you have too. Thanks for your encouraging post Carmen. I am one of those people who like to be cautious, take things slow, and stay two “safe car-lengths” behind the nudging of my heart. Currently in that place and trying to move forward. Hi Beth! Yeah girl, cautious seems so perfect until it holds us back from our calling. Then, it starts to feel like shackles. I know God has great plans for you. Take it one step at a time. Just step! Thanks for your encouragement Carmen.